The best way to get to know a community is by scheduling a tour. See the facilities, meet the staff and residents, and get a feel first hand what it's like to live at Germantown Plantation Senior Living Community Assisted Living. Germantown Plantation Senior Living Community is a new concept in senior living with distinctive southern charm. We have beautiful apartments for both independent and assisted living. Our month to month rent includes utilities, meals, maintenance, and housekeeping and there is no buy-in fee. Residents pay no taxes, insurance or upkeep. We offer transportation to doctor appointments and shopping. No monetary value can be placed on the peace of mind that comes from knowing an emergency call pendant immediately summons our licensed nursing staff to your aid 24 hours a day. 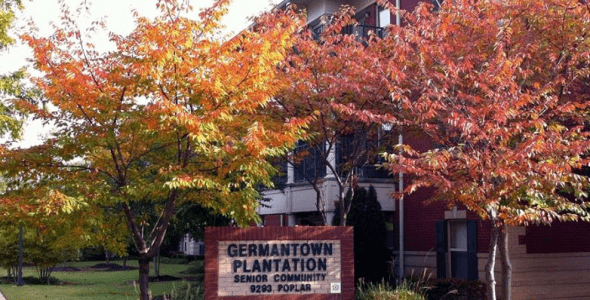 When compared to the expenses of home ownership, living at Germantown Plantation is a great value. We offer three chef-prepared, restaurant style meals daily, plus individualized care packages and daily activities. Residents can enjoy the 50 seat movie theater, indoor swimming pool and Jacuzzi, fitness center, game room and always a full schedule of entertainment and activities. Our dedicated chapel offers religious services for various denominations throughout the week. Independent living is for the individual who has independent health. It is designed for residents who do not need any assistance with the activities of daily living but would like the company and community of other seniors. This apartment is for anyone who is independently mobile (assistive devices are accepted), has the ability to make decisions regarding their safety and is able to evacuate the building on his or her own in case of emergency. These residents provide and dispense their own medications. Germantown Plantation provides a personal life alert pendant free of charge in case of emergency that immediately summons a licensed professional nurse on staff 24 hours per day. Assisted living is for the individual who needs assistance with the activities of daily living but would like the company and community of other seniors. It is designed for the person who needs a special combination of housing, supportive services, personalized assistance and health care. Assisted living is designed to respond to the individual's specific needs. Support services are available 24-hours a day to meet scheduled and unscheduled needs in a way that promotes maximum dignity and independence for each resident. Germantown Plantation provides a personal life alert pendant free of charge in case of emergency that immediately summons a licensed professional nurse on staff 24 hours per day.